In the midst of a tight race atop the AL East, the Boston Red Sox are losing one of their core players on the DL. 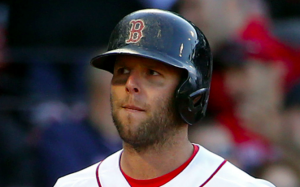 The Red Sox placed second baseman Dustin Pedroia on the 10-day DL Tuesday because of inflammation in his left knee. Pedroia has missed Boston’s last three games because of the knee issues. This is Pedroia’s second trip to the DL this season. He previously missed a week and a half of action with a sore wrist. Pedroia has complained of soreness and fatigue in his left knee for the past week. He had surgery on the same knee last October. Pedroia was scheduled to see a knee specialist on Tuesday. “The improvement that’s being made is slight at this time,” Red Sox manager John Farrell said of Pedroia’s knee on Monday. Despite playing through some pain, Pedroia has actually been at his best lately. During the month of July, he hit .337 with an OPS of .903. Overall, Pedroia is having another productive season and is playing an important role in Boston’s success. Nevertheless, the club has to be at least a little concerned that his knee problems have forced him to the DL heading into the final two months of the season. In the big picture, Pedroia is under contract for four years and $56 million beyond this season. That makes the second baseman’s long-term health an important matter for the Red Sox. Of course, in the short term, the Red Sox are counting on Pedroia to help get them to the postseason this year, preferably as division champions. Boston began Tuesday a half a game behind the Yankees in the AL East but on top of the wild-card standings. With Pedroia out for the foreseeable future, Eduardo Nunez is expected to step in as Boston’s primary second baseman. Nunez was acquired from the Giants last month as a backup at third base for rookie Rafael Devers. However, Nunez is capable of playing every infield position and should be a fine replacement for Pedroia. Brock Holt may also be an option at either second base or third base. Holt returned after the all-star break following an extended stint on the DL with vertigo issues. However, he’s had a tough time getting going offensively this year. With Devers off to a fast and both Nunez and Holt available, the Red Sox should be able to survive the short-term loss of Pedroia. However, the Red Sox won’t want to go too long without their second baseman and veteran leader. Boston could be in a tight race until the end of the season, with each game potentially being the difference between a division title and a one game wild-card playoff. Even if he ends up playing at less than 100%, the Red Sox need Pedroia back as soon as possible.